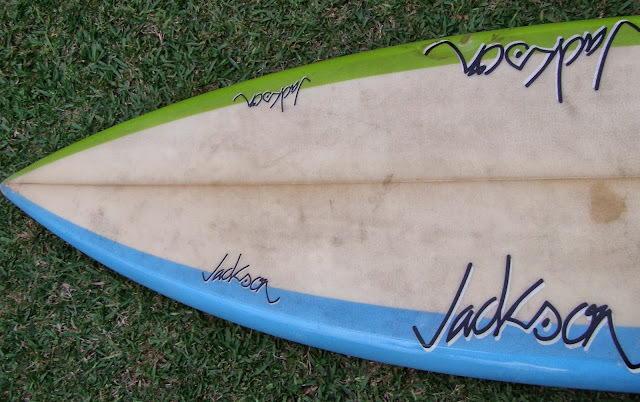 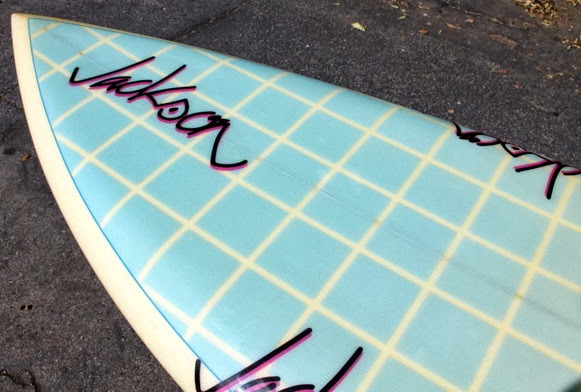 This Jim Pollard shaped Jackson twin fin has been up and down the coast around the world and back again and it still surfs equal to any of the best boards in the collection. 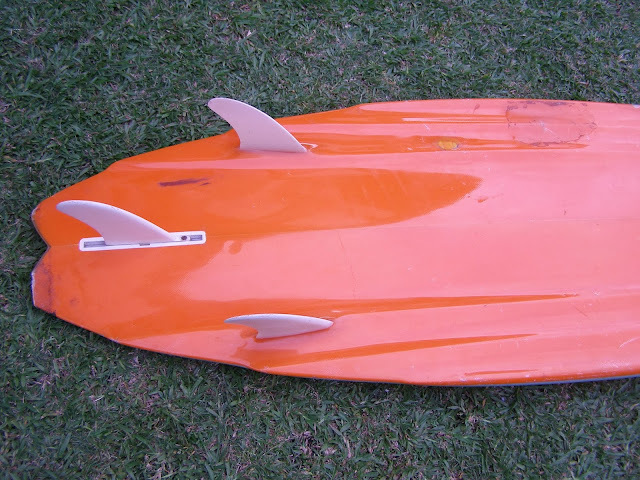 Unbelievably thick, with quite small fins for its size this board is heavy but surfs incredibly well. 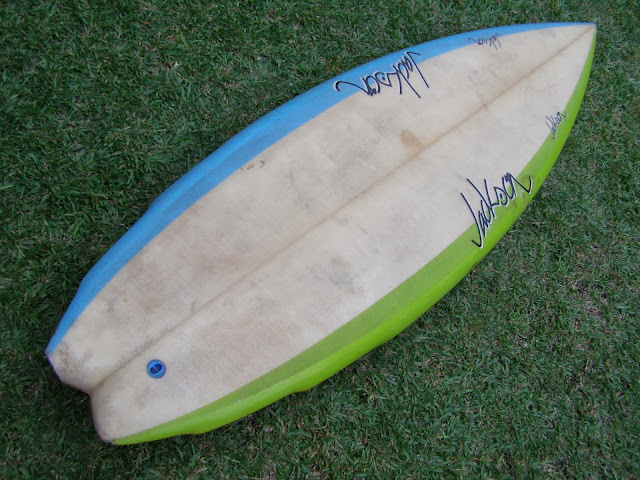 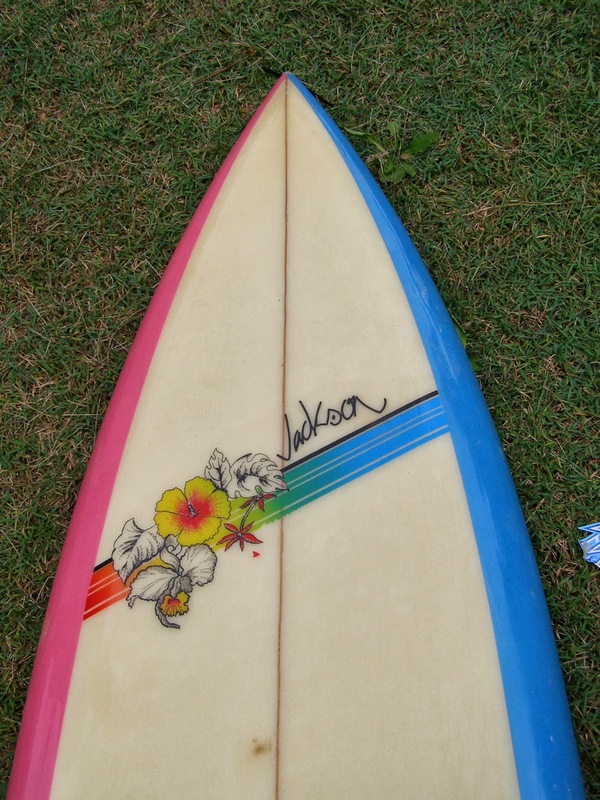 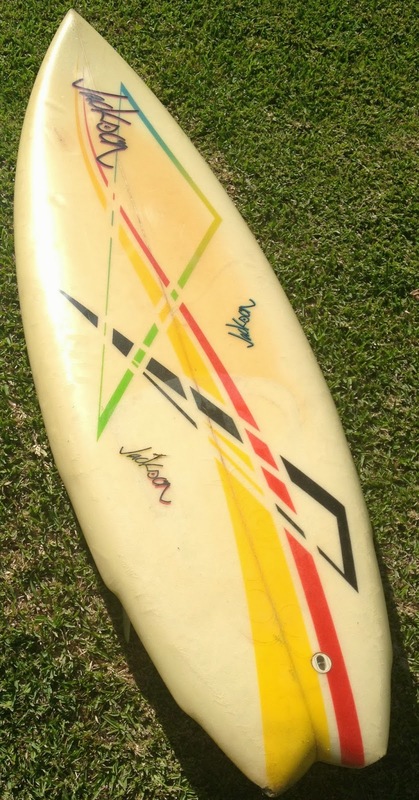 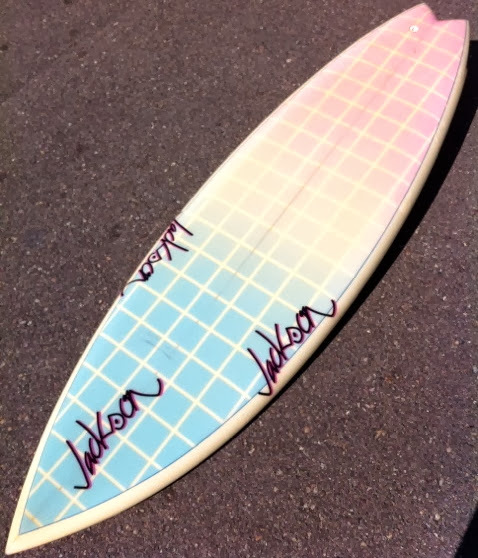 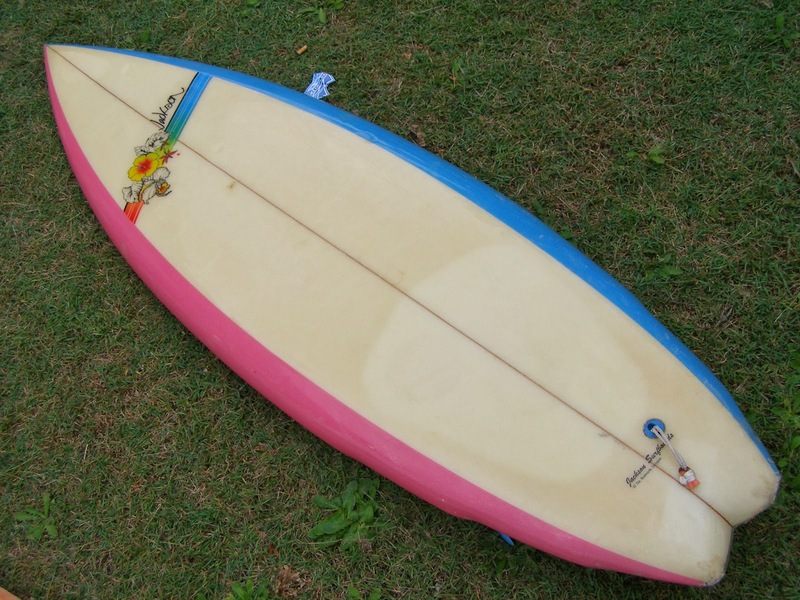 Not a board to take out at a ledging reef slab but suitable for any beachie up to 5ft. 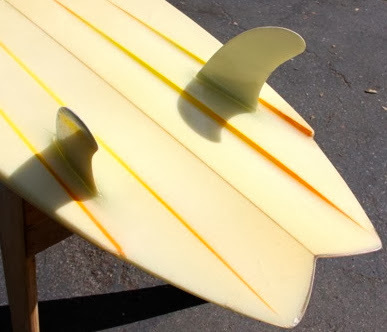 I suspect the deep channels that hide a pronounced vee in the tail and its buoyancy have a lot to do with its fast and loose characteristics. 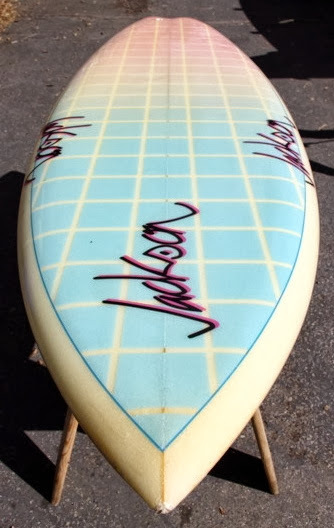 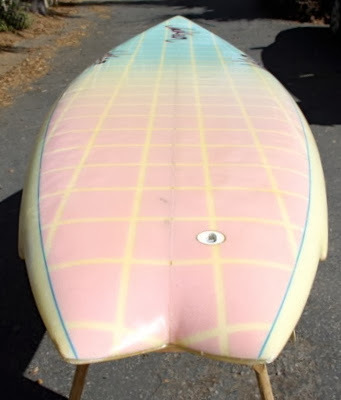 A great board for small clean Californian beach / reef set ups. 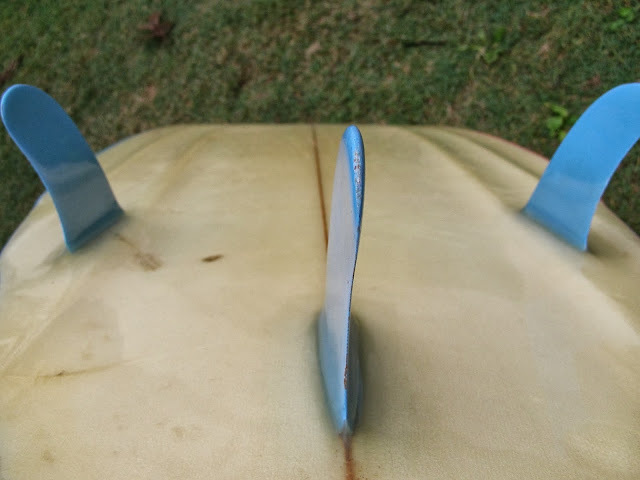 Long straight and deep channels. 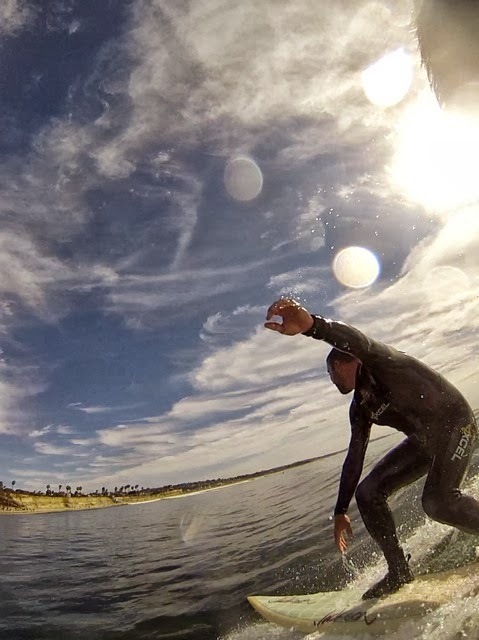 I've not surfed anywhere else in the world that gets as clean and glassy as Southern California. 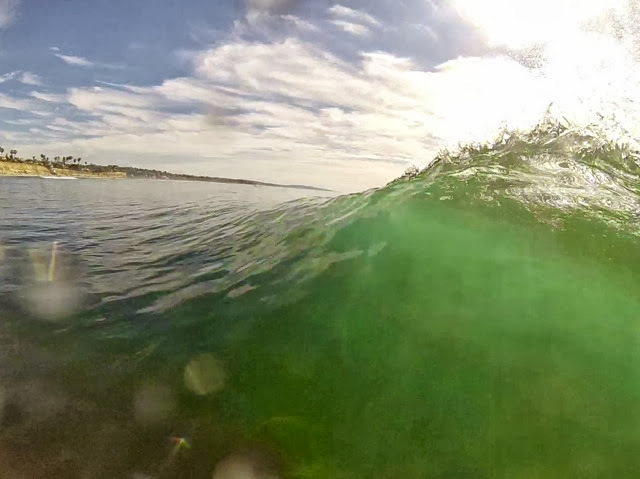 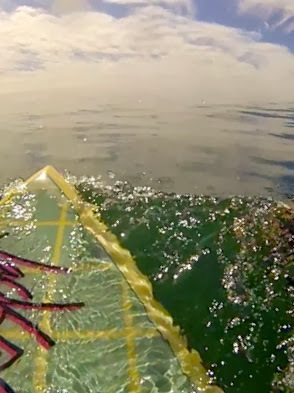 Kelp beds, long period swell and the clam weather brought by being next to the desert all contribute to smooth water. 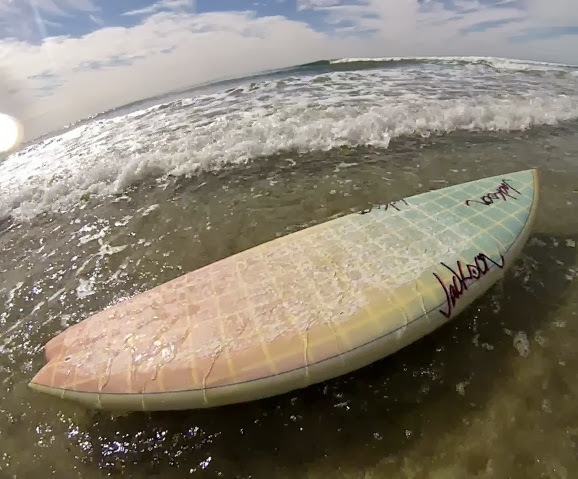 Just me and Jody out for this lunch time session. 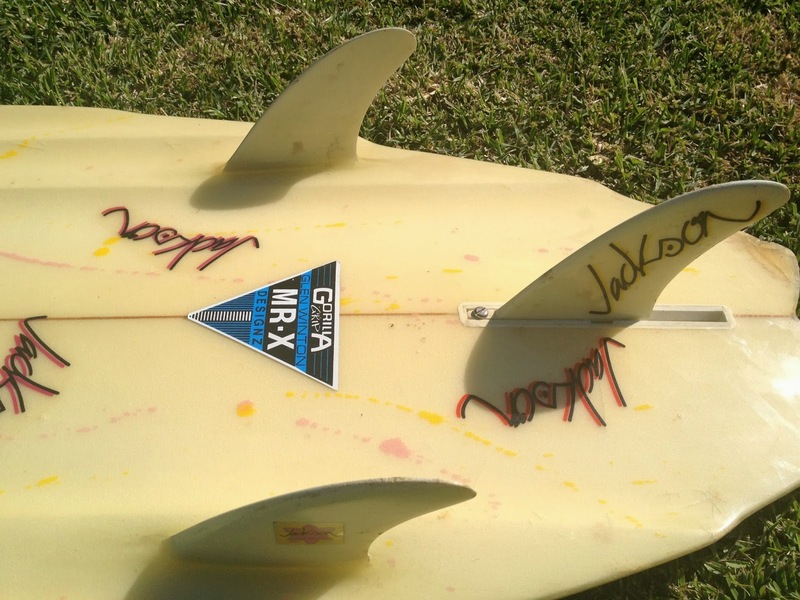 Packed up and ready to go back to OZ. 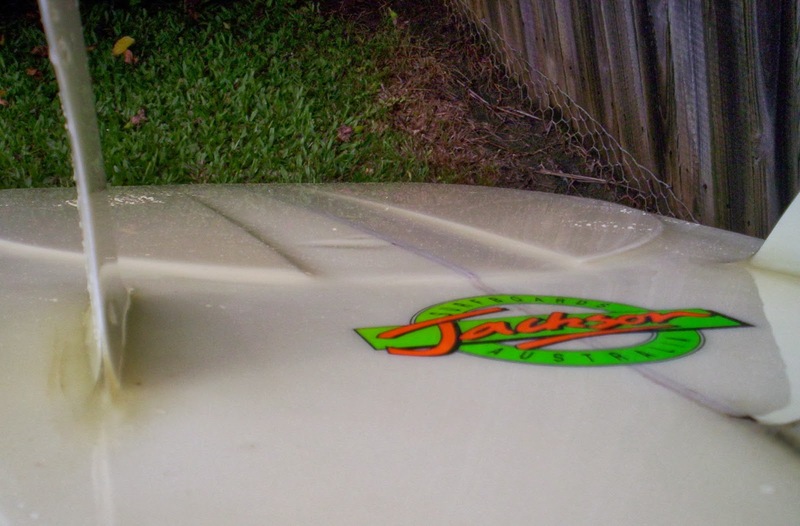 Waiting by the rail road tracks for Jordy to pick me up I snapped these pics that show how neat and clean this board still is after all these years. 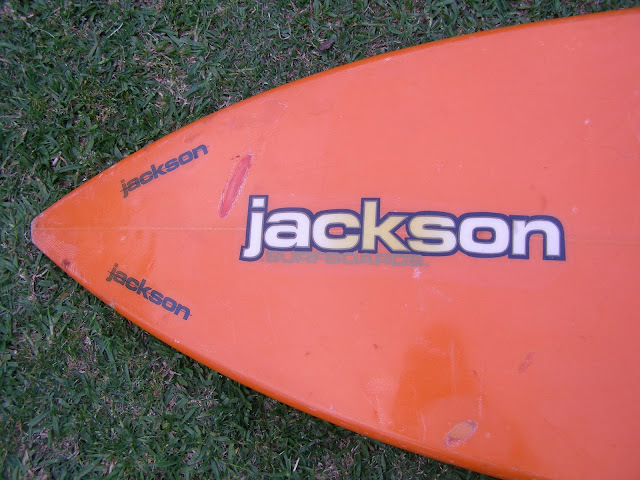 Recently a reader shared these pics of a neat condition late 80's Jackson thruster. 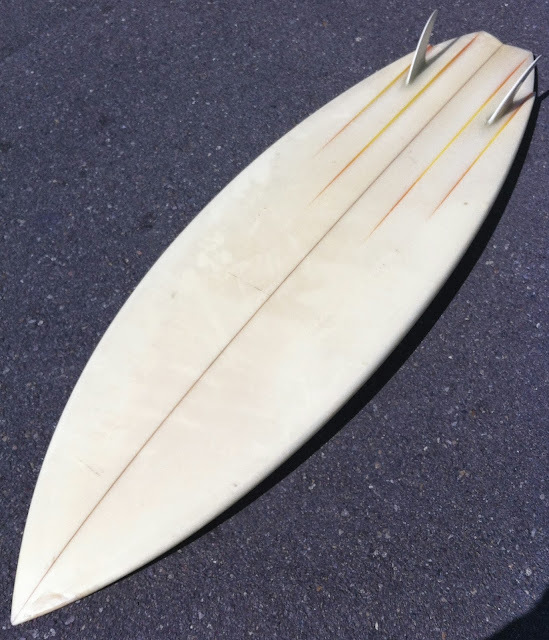 Always the innovators, this board features an unusual step through the tail and a single centre channel. 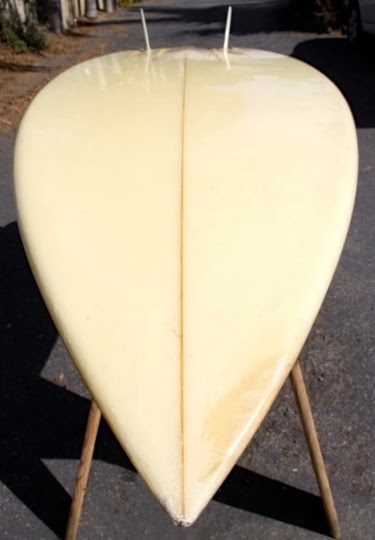 Jim has a lot to do with the development and refinement of the channel bottom design over the years. 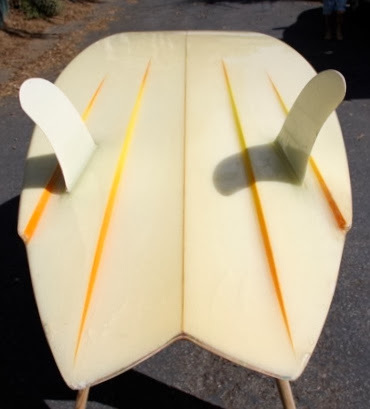 One interesting example is the full length rail channels he was doing in the late 80's like these 3 examples belonging to Gavin.